Environmental education (EE) is vital in imparting an inherent respect for nature amongst society and in enhancing public environmental awareness, according to UNESCO. 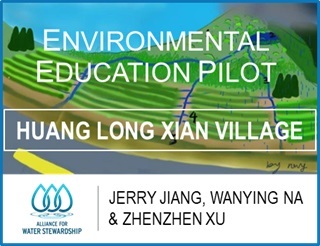 The Alliance for Water Stewardship (AWS) has been working with Qian Bai Yuan (QBY) environmental education centre in Nanjing since 2017 with an aim to raise public awareness on water issues through integrating EE activities with village water stewardship. In this “Water Quality Assessment Project”, high-school students were assigned to investigate the relationship between human activity, water quality and natural ecosystems in Huang Long Xian Village using simple and accessible equipment and tools. Through a week of field work, students were able to map water resources in the village, understand baseline water quality condition and pollution sources, and prioritise water related challenges and opportunities for local community. This pilot shows EE projects can be affordable and beneficial for both the students and the hosting site. Field activities with a clear theme, local context and real impacts allow students to build awareness as well as practical skills. Outdoor EE centers like QBY play a unique role, and further collaboration should be encouraged between outdoor EE centers and formal school education system. 40 kilometers from downtown Nanjing, one of the major cities in China, lies a hilly and mountainous region, where local villagers have been growing tea for decades. More recently, Huang Long Xian Village, where the project site (Qian Bai Yuan – QBY) is located, has also become a tourist attraction with a growing number of guesthouses and restaurants. There are currently 52 registered households and approximately 1.5 square kilometre of tea plantation in this village. By walking around the area, the students identified the following water bodies and land use areas: natural lakes, artificial lakes for tourism purposes, fishing ponds, small seasonal ponds, paddy fields, reservoir and small connected waterways. Using the altitudes recorded on Google Earth, they then tried to find out the direction of water flow. The natural lake is the highest point and the altitude of the waterway gradually decreases as it moves through the tea plantations and paddy fields towards the reservoir. Taking a closer look at the tea plantations, water flows are highly regulated by constructed channels and how the water gathers becomes clearer. In the diagram below, (1) represents the top region of mountains that are often covered by naturally occurring coniferous and/or bamboo forests. 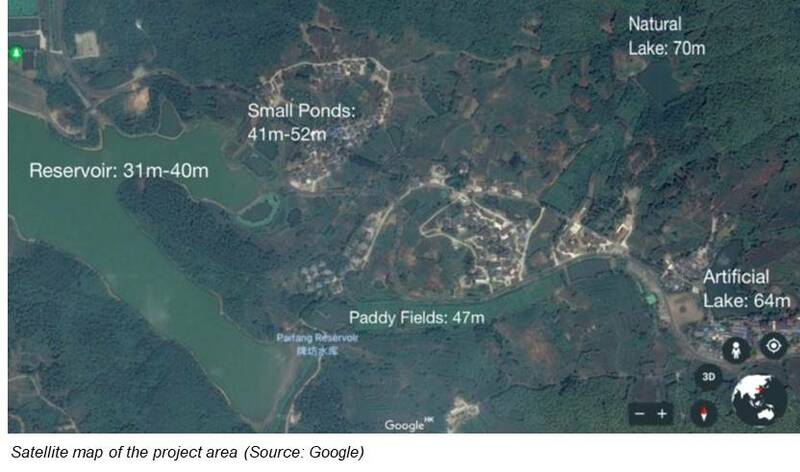 (2) is a natural pond collecting rain water that can be found in most of the mountains in the region. As it rains, these ponds or lakes overflow and the water then flows down the mountains through natural or artificial streams (3) towards the tea plantations. 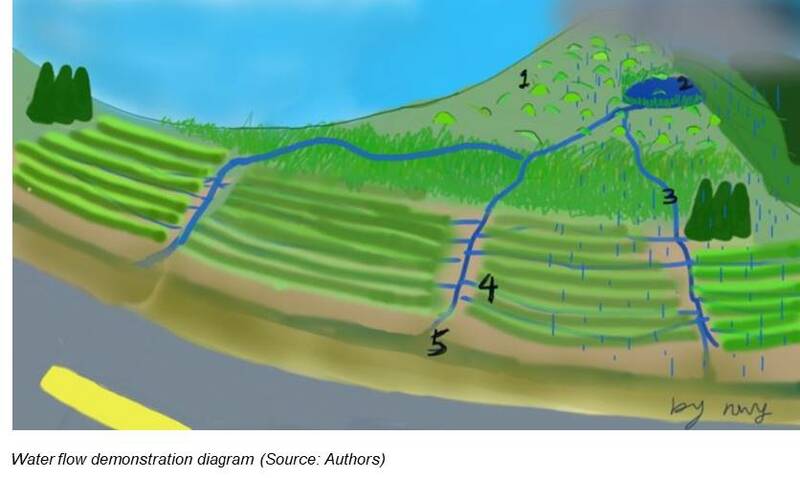 Through manipulation by farmers, the streams divide into smaller streams that irrigate the tea plantations (4) before flowing into the waterway (5) directed towards the reservoir. The students used a pH meter and a Surface Water Quality Testing Kit to measure pH, phosphate, heavy metal, ammonia-nitrogen, COD and iron levels for each sample. The overall water quality is quite satisfactory. However, a clear relationship between water quality degradation and human activity was found. Domestic sewage is the most severe pollution risk to this region; increase in tourism activities will further increase this risk. To tackle these risks, QBY piloted a treatment system for its domestic sewage. The system consists of a sewage collection system, a sedimentation tank, and a long and narrow pond with aquatic plants. The water quality was tested at the outlet of the sedimentation tank, inlet and outlet of the pond. Data shows good removal of phosphate and ammonia-nitrogen at the final outlet. The treated wastewater then flows down to the tea plantation area as irrigation water. If these nutrients are released into the environment, there will be a much greater chance for the local water system to undergo eutrophication and other environmental problems. 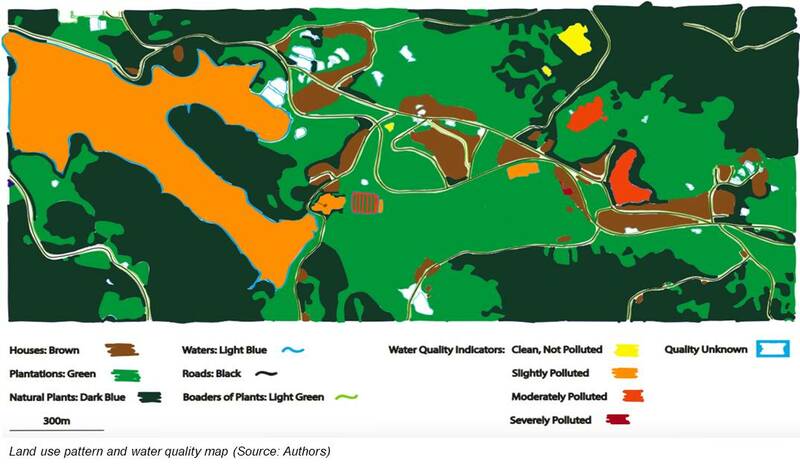 Based on the students’ observation, the local community is not fully aware of water quality conditions and potential pollution threats in this area. Although the overall water quality is not bad, it’s very important to establish awareness at this critical period. Water quality in this region is highly related to farming practices and household sewage management. Domestic sewage treatment should be a priority for pollution control in this area. The pilot system installed in the QBY has demonstrated that simple nature-based sewage treatment systems can be an affordable option. It is worthwhile to advocate for such solutions to the community and local government. QBY can play a significant role in monitoring the water quality in the area regularly; studying the effects of tea plantations, other farming activities and tourism growth on water quality; and leading collaboration on water conservation in this area. Editor’s note: Zhenzhen Xu was a supervisor for this student project. Jerry Jiang is currently a Grade 11 student enrolled in the two-year IB program at Pearson College UWC in Victoria, Canada. He loves environmental science. During his one-year Pre-IB program at UWC CSC in academic year 2017, he did a water quality research on the Quncheng Lake around the campus. He is passionate about water quality projects and is excited about spreading the importance of water quality to high-school students around the world. Wanying is now a Grade 11 student enrolled in the two-year IB program at Mahindra UWC India. She loves environmental science. She had a one-year Pre-IB program at UWC CSC in academic year 2017 and did one year of bird watching. She agrees to UWC mission statement and values and feels excited about connecting them to the advocation of water quality importance. Zhenzhen leads CWR’s stewardship initiatives which focus on rolling out the Alliance for Water Stewardship’s (AWS) International Water Stewardship Standard across Asia Pacific. She has more than 10 years of experience in the field of industrial water solutions, corporate water stewardship and sustainable financing. Previously, Zhenzhen was based in Shanghai, where she established AWS China, heading a team to design and implement on-ground water stewardship programmes for leading MNCs, global brands, Chinese corporations as well as industrial parks and even university campuses. There, she worked closely with multi-stakeholders in critical regions such as the Yangtze and Pearl River Deltas as well as the Bohai Bay Area. Her time spent with businesses, local governments and NGOs to enhance catchment management through strategy & operational roundtables, trainings and site pilots provides valuable insights to managing basin risks. Zhenzhen also advises them on policy interventions and market incentives to build sustainable and holistic models to protect watersheds. Prior to this, she worked for the International Finance Corporation (IFC), co-leading their China Water Program; Veolia Water and Sogreah Consultancy. She holds a Bachelor of Environmental Engineering from Tongji University and a Master of Environmental Management and Development from the Australian National University.